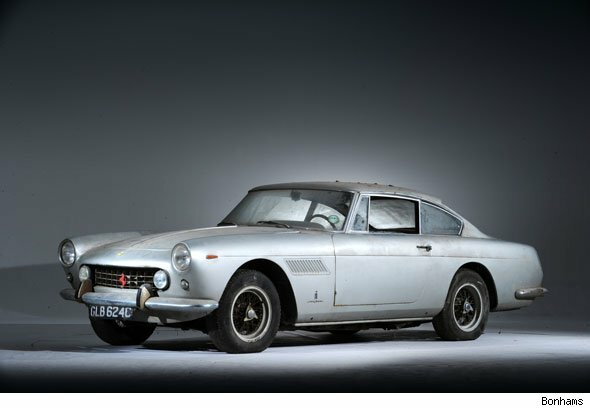 A 1961 Ferrari 250GTE 2+2 'Series 1' Coupé that belonged to famous producer Agostino 'Dino' De Laurentiis will be up for auction at Bonhams on March 3, 2012. Just one of the highlights at the Collectors' Motor Cars and Automobilia sale, the barn find GTE is estimated to sell for £40,000 - £60,000. The car is believed to have only been used for eight or nine years of its life and still has the tax disc which expired in 1975 displayed in the window. Famous for producing films including Barbarella, King Kong and Man Hunter, the late De Laurentiis received two Oscars for La Strada and Nights of Cabiria, both for Best Foreign Language Film. He has over 150 films to his name. From the pictures, the Ferrari obviously needs some serious restorative work to bring it back to life, but there's no doubt that it is sure to catch the eye of a keen collector or two who can see the potential of this rare model. Rob Hubbard, Senior Specialist at Bonhams said: "This well-preserved 'barn find' represents a wonderful opportunity to acquire an original and untouched early Ferrari 250GTE, ripe for sympathetic restoration by a fortunate new owner." Speaking to the Daily Mail, Bonhams believe it will cost £100,000+ to bring the Ferrari back to its former glory, with the engine alone commanding £50,000. Think the GTE is worth the money? Would you put a bid in if you had the money? let us know in the comments section below.